Until 10 January 2013, visitors to Tashkent's Fine Arts Museum have a chance to view a small, though exceptional collection of Pablo Picasso's ceramics. This exhibition has been paired with strong ink drawings of Nadeja Kashina. 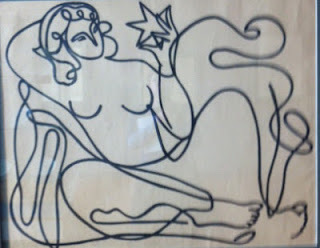 Her expressive graphics are reminiscent of Picasso's, whose work she greatly admired. The back story of this exhibition is intriguing: after the death of French artist Fernand Léger in 1955, his Belarussian-born widow, Nadia Khodossevitch, donated many works from their private collection to the Soviet government. (Both Léger and Khodossevitch were communists). 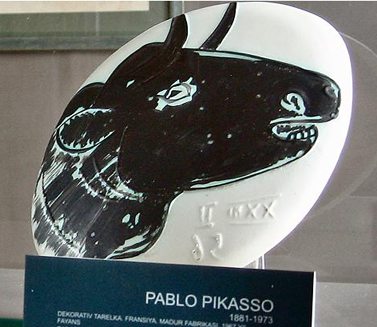 The Soviet government distributed art works to museums throughout the USSR, and the 12 Picasso ceramics ended up in Tashkent, where they were exhibited in the 1960s. After that it seems they were placed in storage and, over time, forgotten. In 2004, while sorting through boxes, museum staff unearthed these priceless pieces. The ceramics - plates, jugs and bowls - were all produced in the Madoura ceramic workshop in Vallauris, France. Inspired by his portfolio of sketches, Picasso collaborated with the Madoura team from 1946 - 1970 producing around 630 pieces. The pieces on display in Tashkent were made in 1960 -1961. Nadejda Kashina, whose drawings form part of this exhibition, was born in the Russian city of Perm in 1896 and moved to Tashkent in the late 1920s, after studying in Moscow. Kashina wrote that what attracted her in Central Asia were 'colouring, type and the huge amount of untouched topics'. Her Samarkand paintings in particular are bright and vibrant. 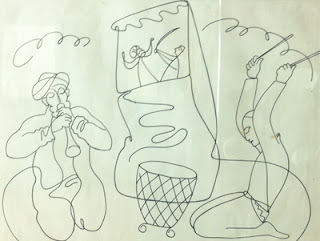 In this Tashkent exhibition, ink drawings done in the 1970s, shortly before her death, are displayed. Picasso's influence is striking. For travellers on Uzbek Journeys tours, you have a chance to view Kashina's avant-garde paintings at the Savitsky collection in Nukus. As an interesting aside, the Savitksy collection includes 79 classical sculptures replicated for Léger in the Louvre, and given to Savitksy for his collection. Although not of particular interest to foreign visitors, this collection forms an important part of the Nukus museum's education program for schools.